Nexus for Development provides access to finance for entrepreneurs across Asia by creating and managing innovative funds and facilitating dialogues to foster mutual understanding and improved collaboration between social enterprises and financiers. Nexus for Development envisions a world where enterprises can fully access the resources required to scale low-carbon technologies benefiting communities with clean energy and water. CERF is initiated as a pilot fund made possible through grant contributions from international partners REEEP, the Austrian Government and the Blue Moon Fund. Pioneer Facility, the innovative debt facility, is launched with the support of three major investors: FFEM, Phitrust, Lorinet foundation. Nexus delivers its largest issuance of carbon credits to date from a biogas project in Vietnam measured at over 1M tonnes of CO2 avoided from the project. We develop and manage innovative financing solutions that blend traditional development funding, debt finance, impact investment, and climate finance. We work with a range of financial partners to target poverty and climate change to overcome market barriers and financing gaps. We manage a network of 20 NGOs and social enterprises who work to deliver low-carbon solutions in Asia to vulnerable populations. We provide the expertise and resources needed to support the scale-up of their clean energy and water projects. Our long-term goal is to grow our network of like-minded organizations and continue to provide a space for capacity building and South-South knowledge sharing. Our activities with our partners contributes to the Sustainable Development Goals (SDGs), also known as Global Goals, to end poverty, protect the planet and ensure that all people enjoy peace and prosperity. Nexus for Development estimates its carbon footprint in accordance with the GHG Protocol. In 2017, Nexus carbon footprint was 58 tonnes of CO2 (tCO2) emissions. Nexus has been effectively limiting some of its footprint activities. Nexus staff live within only 4.2km of our office in Phnom Penh and many cycles to work. Our paper supply is sourced from sustainably managed plantations that are carbon negative, sequestering carbon using fast-growing tree species in unused farmland. Office coffee is organic and locally sourced. 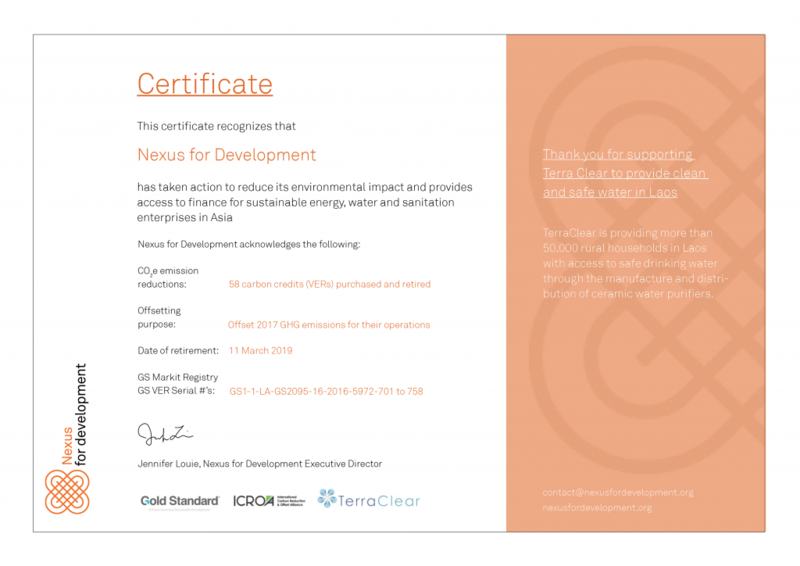 In addition to internal efficiency measures and initiatives, Nexus offsets its emissions by purchasing high-quality, Gold Standard carbon credits from a collection of its member projects.